The Key to Homemade Lunchables. 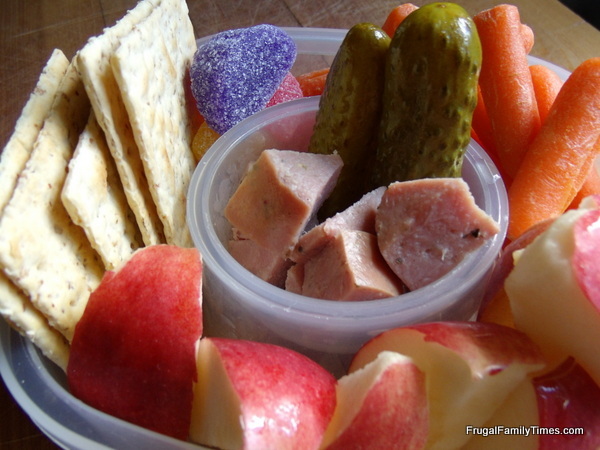 An easy, healthy way to feed kids - especially picky eaters. Our kids are mostly OK with the non-packaged, reusable container type lunches we pack them for school. Mostly. But every once and awhile we get complaints/requests around Lunchables. We dismissed them out of hand the first few times, explaining to the kids about how expensive and unhealthy they are, and getting mostly understanding looks. When we kept getting the requests, Robin got to the bottom of it by asking, "What is it that you like about them?" Their answer: "They come with that little treat". Armed with this knowledge, we were better able to fight the Lunchable foe. Simply by adding the occasional little container with Oreos or gummy worms, we killed the Lunchable. Now, we are turning their format to our advantage! Over the Summer, the kids got bored with our usual lunches once and awhile. So I pulled out a plastic container or two, chopped up some things and placed them in sections. Lunch containers with compartments like these, make this even more interesting - and opens up more options for what you can include. Win all around! I always included the dessert up front - just like they would get control of in school. I also tossed in some things that I had forgotten about (walnuts, for example, were all the rage this spring) and see if they go again. We are always surprised at how well they will eat these things up. They usually won't eat all of everything, but they will try it. Today walnuts were a hit after no requests for them for weeks. And strangely enough, even when given the choice of eating dessert first, they usually leave it until the end. 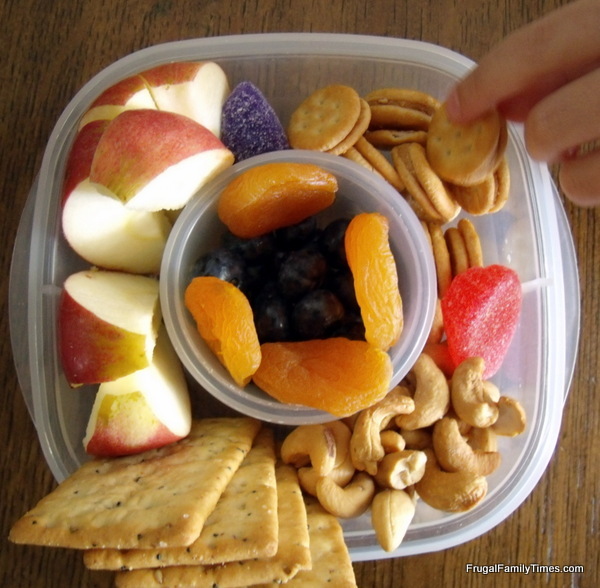 Dried fruits like apricots, dates or "Craisins"
Whatever you put in your Lunchable, make sure you only put in small amounts from each group to make a complete meal. This is our way of making them eat something other than just their favourites; if they are still hungry they will try some of the other things in front of them. As for time - other than having this stuff on hand when you go grocery shopping, I timed the actual production and it is less than making KD. 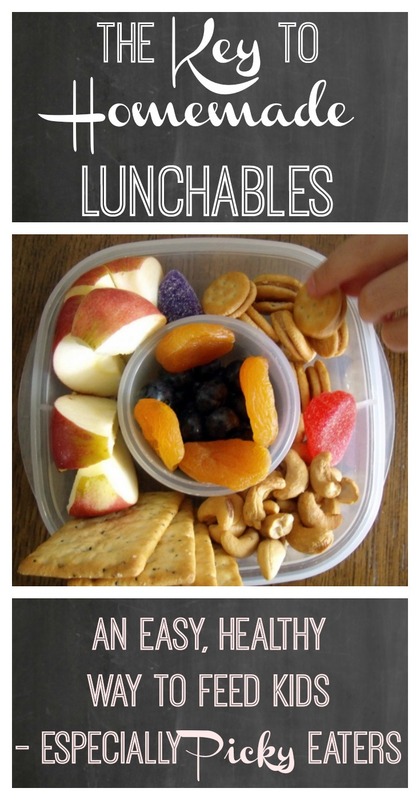 So stick it to Lunchables and make your own! Love this idea! Even thought we're planning on homeschooling, I think I'll be trying this, just for the sake of having something different at lunch. 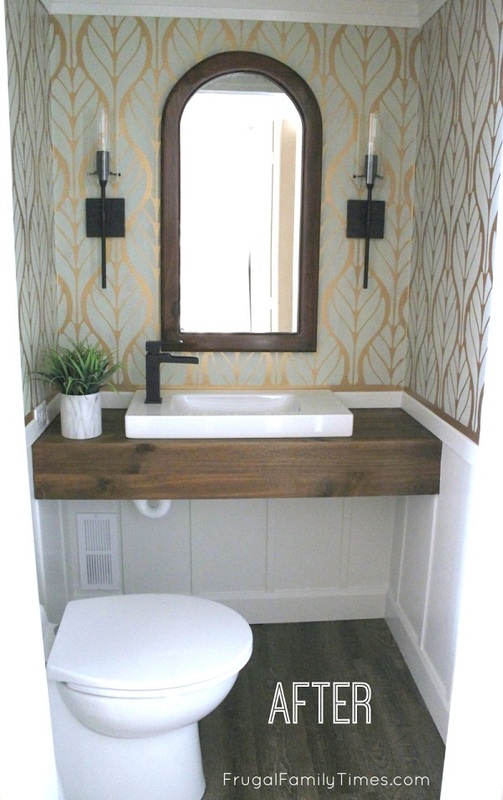 We use this idea all the time on days a home, too. Just today in fact! Thanks for your comment, Jennifer Lynn! Popping over from IHeart Organizing -- what a great idea. Love all these tips! Thanks, Kelly! Glad you dropped by! 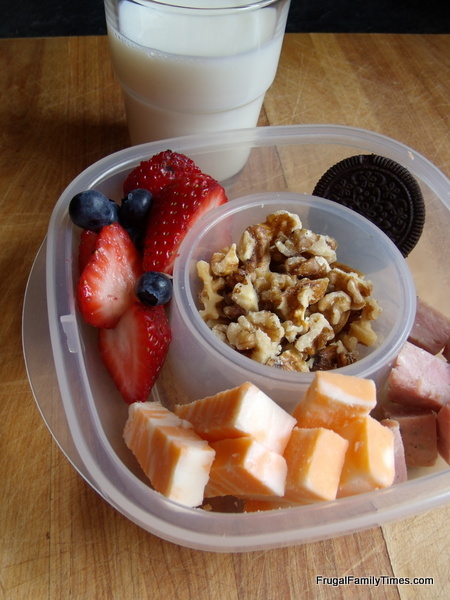 I have little containers like this, and make lunches like this for trips to the zoo etc. I'm always amazed when they leave the M&M's or other treat until the end. Thanks for the ideas. We do the same. A great way to save money (and eat better), isn't it? Thanks for your comment, Erin!